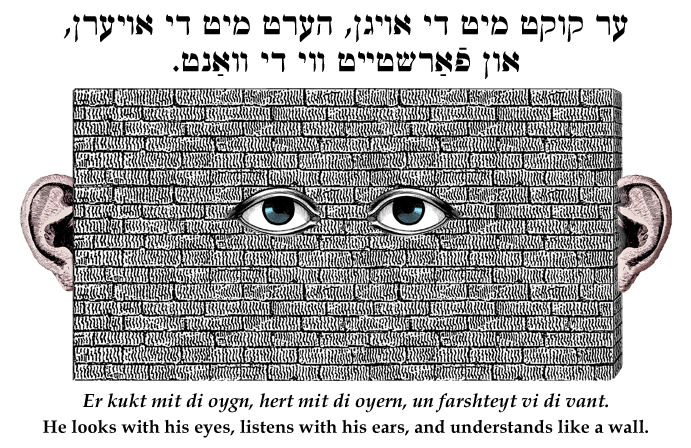 Yiddish Wit: He looks with his eyes, listens with his ears, and understands like a wall. ער קוקט מיט די אויגן, הערט מיט די אויערן, און פֿאַרשטייט ווי די וואַנט. Er kukt mit di oygn, hert mit di oyern, un farshteyt vi di vant. He looks with his eyes, listens with his ears, and understands like a wall.